When periodontal disease reaches an advanced stage, it’s downright dangerous for your smile. When hygiene cleanings aren’t enough, or if the tissues have become too damaged, then the best course of action is periodontal surgical treatments. 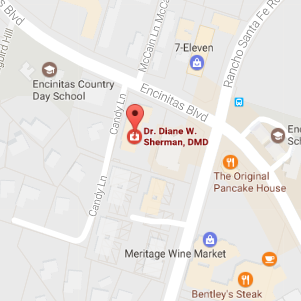 At our Encinitas, CA dental office, our mission is to prevent gum disease from ruining your smile. In addition to comprehensive examinations during your routine visits, Dr. Sherman and her team work hard to educate patients on the causes and symptoms of this condition. From diagnosis to treatment and prevention, our Encinitas dentist is dedicated to helping patients overcome gum disease and enjoy beautiful, healthy smiles. This is often the first line of defense, and involves reaching under the gum line to clear away plaque and smooth the root. Clearing away the plaque removes the bacteria and acidic waste that leads to decay. By smoothing the tooth root afterwards, it leaves no surface area for bacteria and plaque to adhere to. You can read more about this treatment here. When your gum tissue recedes to the point of exposing your tooth root, that’s when it may be time for soft tissue augmentation. This tissue graft treatment applies new oral tissues to your gums in order to promote regeneration and healing. It’s a surgical procedure that requires sutures, so patients must expect a recovery period. A side effect of periodontal disease are deep pockets forming around the affected teeth. As the gum tissue weakens from the disease, they pull back from the tooth and expose the bone underneath. Gingival flap surgery is designed to clear away diseased tissues and enclose the gum tissue around the tooth again. If needed, new bone material will also be grafted underneath to promote faster healing and sealing around the tooth. Not only are the layers of your teeth important, but the gums are also a first line of defense against bacterial infections. They stabilize your teeth in the jawbone, but when the tissues recede, your teeth start to loosen or even fall out. In the aesthetic aspect, gums are what “frame” your teeth as well. When gums recede, your teeth appear longer. Plaque accumulates in the spaces left behind the bone underneath starts to atrophy. Patients have reported feeling self-conscious about their appearance, and we want to help you avoid feeling this discomfort. At Diane W. Sherman, DMD, we not only want your teeth to look good, but we want your gums to be healthy too. We have periodontal treatments available, and will even refer you to a periodontist if your case is severe. Let us help you get your health on track by giving us a call for a consultation.